The 13 objects in this outstanding solo show cohere in so many ways that the installation itself becomes a phantom 14th piece, the subliminal guest at an enigmatic reunion of themes and spirits. At mid-career, Alison Saar has achieved a rare and profound balance between accessibility and exploration. One of the four daughters of epochal African-American artist Betye Saar, Alison draws freely on African and post-modern art languages, speaking a kind of visual Creole that transfigures scenes of brutality and degradation with wit and occasional, unexpected flashes of hope. It’s a real achievement for the Atkinson Gallery and its director Dane Goodman to have such a masterfully conceived show by such an important artist, and it reflects well on Santa Barbara City College and its arts program that the exhibit feels so right and speaks so powerfully in the space. “Coup” (2006), the monumental assemblage in the center of the room, could launch a dozen dissertations. 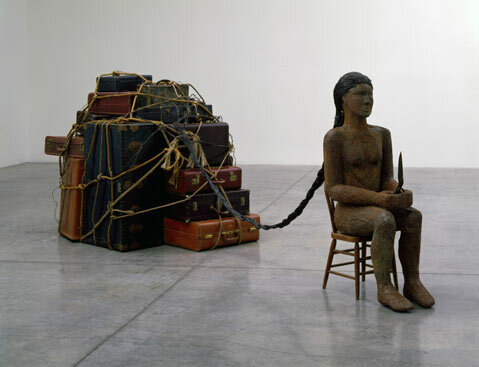 A life-size sculpture of a seated black woman faces ahead, her braided hair stretched behind her to an unnatural length only to end in a rope-wrapped jumble of old suitcases. The figure is made of wood, but armored in salvaged tin ceiling tiles, the product of a vigorous multi-part sculpting process that Saar does all by herself, wielding everything from tin snips to a chainsaw. In the figure’s lap are shears, held upright, slightly flexed, and seemingly ready to cut the whole bundle loose-along with the beautiful braid. Parked in front and behind of “Coup” are brilliant pendant pieces that extend the metaphor and elaborate on the ironies of the central image. “Coup (study)” (2006) is a large charcoal drawing made on several sheets of handmade paper and assembled into a single large patchwork image. It clarifies and amplifies what the sculpture intimates-yes, this arrangement is improvised, and yes, this figure is naked. Flush with the wall ahead of “Coup” stands an uncanny sculptural folly called “Proclamation” (2006). At first glance, “Proclamation” looks like a long, single braid of human hair that has been cut free and nailed to the wall. On closer examination, both braid and nail are made of cast bronze, and the notion that they are hanging from the wall rather than standing against it is an illusion. 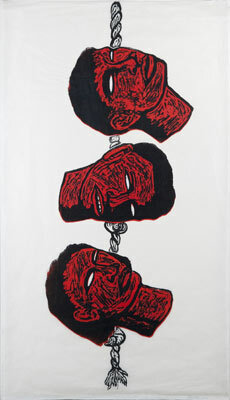 Within the circuit of Saar’s repertoire of images, “Proclamation” symbolizes emancipation from the burden represented in “Coup” by the bundle of bags. In the adjacent context of post-modern sculpture, “Proclamation” appropriates the revolutionary attitude towards wall-hanging art expressed by Richard Serra’s various “Props.” Saar’s easy way of injecting art-world references into the real-world wisdom of her art turns the gallery into a space of buzzing, truly multicultural conversation. 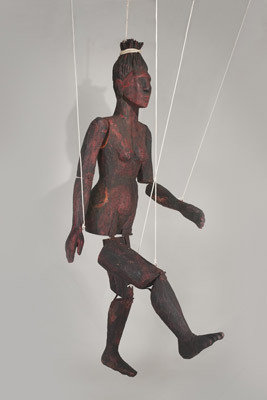 The other large sculpture in the exhibit, “Cakewalk” (1997), is an oversized marionette strung up by the remaining hank of her severed hair and available for manipulation by a set of four ropes running through pulleys overhead. Visitors are encouraged to try their hands at choreography by pulling on the control ropes. The giant wood figure, which has an impressive patina of red and black, swings freely in front of a plate glass window overlooking the Santa Barbara harbor. “Cakewalk” symbolizes the perpetuation of a power structure in which slaves dance for their master’s amusement. As such, it can be read as one of the most devastatingly ironic and bitterly sad self-portraits in all of art history. Yet despite the disturbing implied request to “pull some strings,” “Cakewalk” swings just short of being a simple totem of torture. Diminutive when compared to the giant “Cakewalk,” but at least as large in spirit and significance, the sculptural assemblage “Inheritance” (2009) serves as an emblem of this particular exhibition and the collaboration between the artist and the gallery. This bronze statue of a very young girl carrying a large ball of white cotton cloth on her head is a portrait of the artist’s mother. When Betye was just four years old, her father called her to his deathbed to make a final request: Would Betye promise to take care of her mother and her siblings when her daddy was gone? The enormous ball represents the weight of the world, making the young girl who carries it a “child Atlas.” Saar and her mother have traveled to Senegal together, where they saw children who do carry the weight of the world on their heads every day. Their observation of this painful situation recalled Betye’s childhood and suggested the concept for the piece. “Inheritance” has been realized as a series of nine in the SBCC art department foundry, and members of the college’s faculty and student body have participated with the artist and her mother in constructing the finished products for this show. It’s a beautiful image of the complex integration of artist, space, community, and institution achieved by this important and thoroughly satisfying exhibition.